A little over a month ago, I had the chance to meet Graydon Moffat, the lovely creator behind Graydon Clinical Luxury by Nature. We had a great time chatting over green juice and I left thinking how wonderful it would be to share everything I'd learned with all of you. Rather than me just writing about it, I asked Graydon if she'd be willing to answer some questions and lucky for us, she was happy to oblige. Let's jump right into it! 1. I love learning how people first became interested in a more natural, holistic lifestyle. What did that journey look like for you? Growing up as a teenager in the 80’s my diet involved a lot of diet soda, sugarless gum and white bread. I did a lot of high intensity aerobic classes and enjoyed using tanning beds. In university I supplemented my tuition working as a pastry chef in fine dining restaurants. No surprise I was experiencing a lot of digestive issues. It wasn’t until I moved to California to do my MFA that I was exposed to a radically healthy lifestyle which consisted of a lot of yoga, fresh juice and a macrobiotic diet. Besides making art, I transitioned my ‘moon lighting’ as a pastry chef to starting a macrobiotic home delivery service called ‘Divine Dishes’. Aligning myself in a health oriented spiritual path made for a huge shift for both my physical and emotional well being. Suddenly I felt good ‘in my body’ and my natural tendency towards anxiety also diminished greatly. 2. 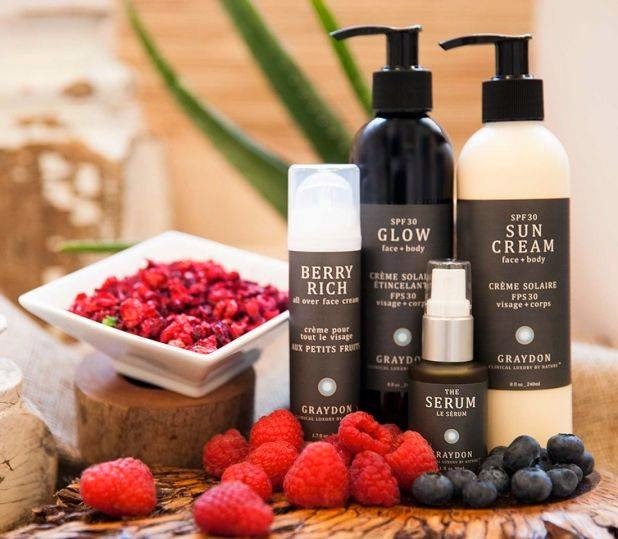 What inspired you to start Graydon Clinical Luxury? After moving back from California to Toronto I became part of the Downward Dog Yoga Studio first ever teacher training program in 1999. As a yoga teacher I enjoyed making holistic products to use on my clients. My first product was a yoga mat spray (which is now my Germs Away Mist). Then I made a luxurious aromatic oil to use in a neck and temple massage (now my lavender chamomile sandalwood inspired All Over Body Oil). My customers loved my products and with their encouragement and support I just started making more stuff using the principles of holistic and ayurvedic health I had learned through my yoga teacher training. 3. 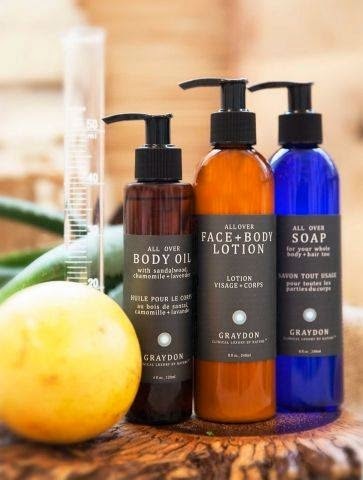 What sets Graydon apart from other natural skincare brands? We carefully curate our ingredients – and look for items that come from nutrition rich plant based sources. For example, the seeds from broccoli and berries grown in the Fraser Valley are amongst our favourites. We work with a small cold press manufacturer to produce the oils from these seeds which we use in our formulations. We work a with lab to small batch our products which is a much better choice than making them on our own. This means we can offer our customers a clean, safe, consistent product that would be much harder to produce if we still manufactured in our home office (which is where we started). 4. What does your skincare routine look like? Besides using all my products on a regular basis, I love to mash up and slather super foods all over my face and body. Rolling up my sleeves and getting creative in the kitchen reminds me of my art making and chef days. Given that I often work from home, I have been known to answer the door with avocado cacao paste smeared on my cheeks which has startled delivery people and customers picking up their orders. 5. If you had to pick just one, what's your all-time favorite product or the product that you're proudest of from the line? I love all my products but I can’t live without my Cleanser. I use it all over my face and body. Its rich creamy (but not oily) texture leaves my skin feeling super clean, soft and moisturized. I also shave my legs with it. In terms of being proud, The Serum is hands down the most nutrient dense power packed product. Roughly 50 pounds of Canadian grown berries are packaged into our 1oz glass bottle. The oomph that these berry seed oils gives your skin is incredibly potent. I blend in a few drops to every product I use just to make sure my skin gets the nutrition it needs every day. 6. What tips would you offer to someone looking to make the switch from conventional skincare products? Make it easy for yourself by just replacing one item at a time. Don’t feel like you have to throw all your conventional products out at once. Get used to reading labels and making good (plant powered) choices for your skin just as you would with food products you choose to eat. And start thinking about your skin as an organ similar to your stomach -- as a vehicle to bring nourishment into your body. It becomes simple after a while, to choose between whole foods vs junk/highly process foods… skincare products that ‘feed’ your body vs ones that are made with synthetic, often toxic (junk) ingredients. 7. 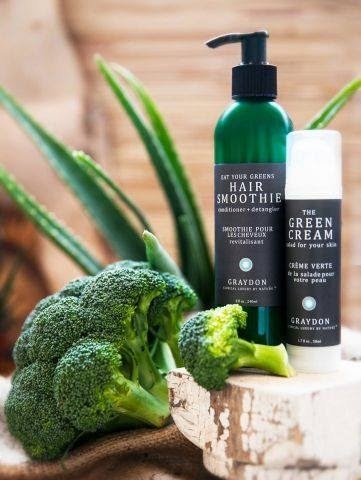 What can we expect in the future from Graydon Clinical Luxury? Any hints on upcoming products? I get asked about a deodorant, scrub and bug spray all the time. It takes time to find the perfect ingredients, packaging and above all to do the proper lab development and efficacy testing – but within the next year we hope to have some new products out, so stay tuned! Thanks Graydon! I, for one, can't wait to see what's coming next! Great post! I've been wanting to try Graydon for a while & one day I will. The best advice I did not take myself, "Make it easy for yourself by just replacing one item at a time. Don’t feel like you have to throw all your conventional products out at once." Thanks Paula! I definitely recommend checking out the line. I did the same as you...skincare was a little more gradual, but my conventional makeup got thrown out all in one go! Thanks Audrey! I'm not sure if there are any European retailers yet, but the line is available internationally through Clementine Fields. The packaging looks fantastic, lovely post! thanks for sharing!